Shoppers are flocking to the top of the Selfridges shop in London for a sky-high water experience after it installed a green lake complete with rowboats and panoramic views of the city below. 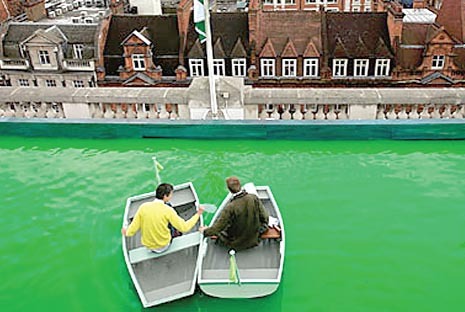 The lake is part of a project called the Truvia Voyage of Discovery that has transformed 400 square metres of the store’s roof into a “magical island and boating lake”. The art installation creates a playground for shoppers and even features a lifeguard to watch out for rowers in trouble. There are 12 boats available however bookings for the experience have already sold out. It is the first time since World War Two that the roof garden has been opened to the public. At the time the garden was a popular spot for walking however after the bombing of the department store in 1940 owner H. Gordon Selfridge vowed to keep it closed. The roof had to be reinforced with steel in order to hold the lake. Inspiration for the installation came from a gondola party in the Savoy in 1905, when the courtyard was flooded. The roof lake will be open until July 24.